For a week I have now that laser cutter, and while I had to tweak things, that machine is so far operating nicely. I actually did not really believe in that 50 Watt power, and even at the university we do not have the equipment to measure the real output power. We can measure up to a few Milli-Watts (say the level of laser pointers), but not to the amount of energy such a ’50W’ machine can produce. Instead, I describe how I have tuned the machine so far and what I’m able to get out of it. 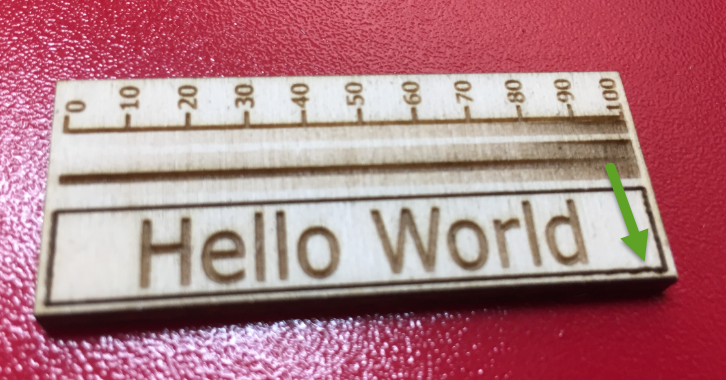 Experimented with different materials, adjusting cutting/engraving speed and laser power. 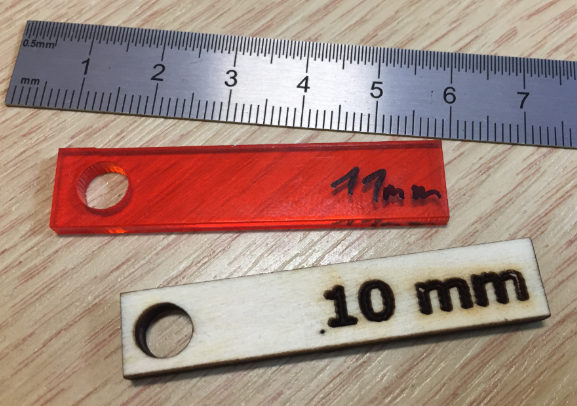 Thinner material did cut well around 40 or 30% laser power. 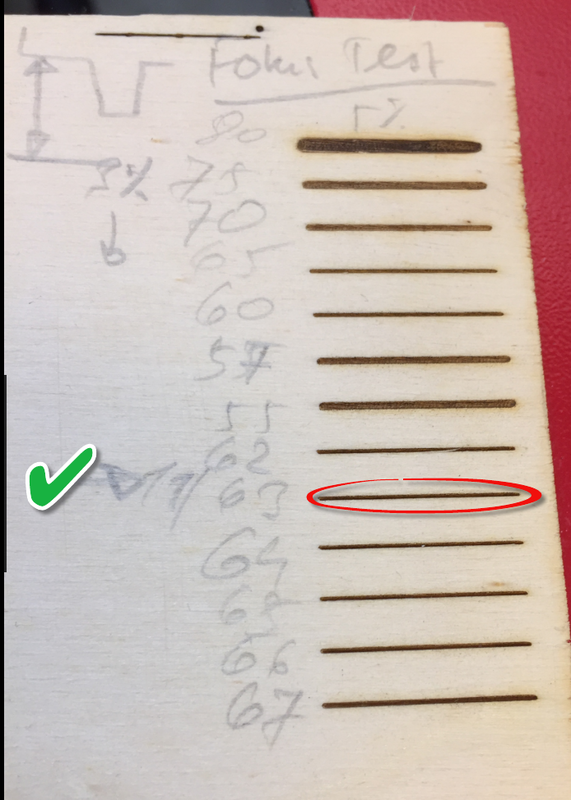 With thicker materials (4 or 5 mm plywood or similar), I noticed that increasing laser power above 70% did not help much. 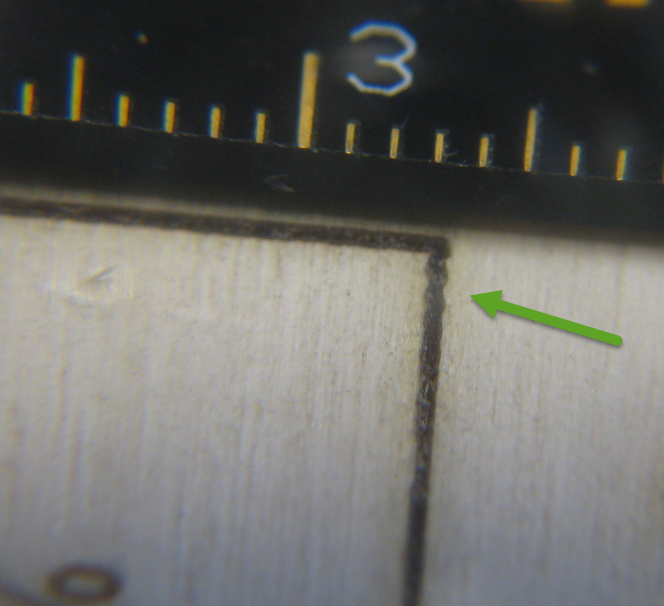 Instead, slowing down the moving of the laser head helped to get through the material. So I was wondering how much of the (percentage) laser power is really usable. RDWorks published a nice video how to find this out. So I have used the same approach: cutting a piece of acrylic with different power settings. I have used a 5 mm acrylic with 15mm/sec cutting speed. From the picture above you can see the ‘V’ style of cut which is noticeable especially for thicker material. In order not to cut through the material I increased the moving speed to 15 mm. 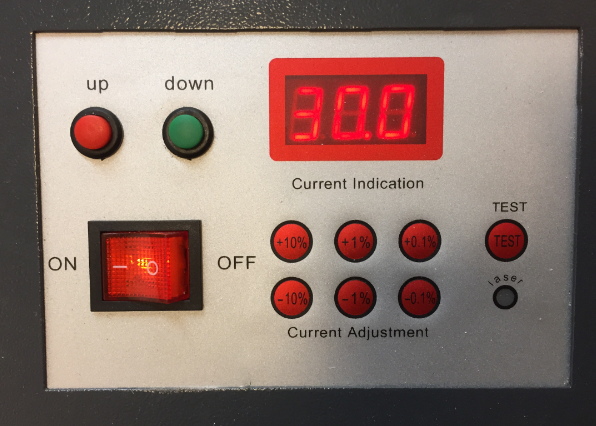 This gave me the following result, with the numbers indicating the laser power percentage (maximum I can set is 99%) set on the machine panel. In essence, the cutting depth increases in a linear way with increasing the laser power, but only up to around 85%: above that I don’t get more cutting even with increasing the laser power percentage. I conclude that if the laser tube has a nominal maximum power of 50 Watt, I really get 85% out of it, or around 42.5 Watt. Or as a rule of thumb: I can expect effectively 40 Watt out of a 50 Watt laser tube. Or using the machine above 80% does not make sense and probably only shortens the tube life time. 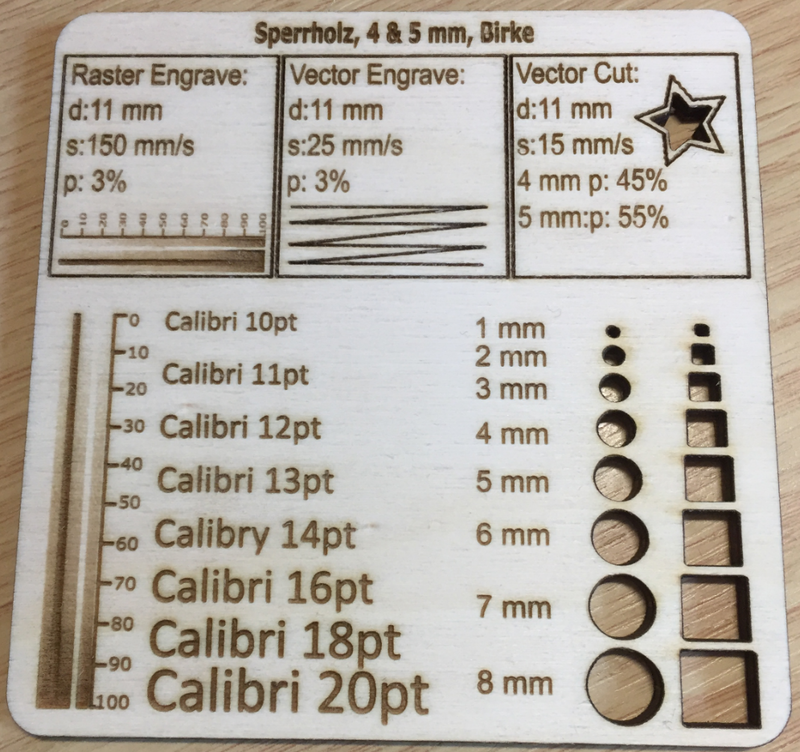 Knowing the correct focus point distance is essential to use a laser cutter and engraver. Every material is different, but at least I have now some good ‘rule of thumb’ values determined for my machine. The small oscillation of the laser head is something I can reduce with slower speed settings. Maybe I find a way to mechanically optimize this so I can run vector engraving with higher speed. The amount of laser power I really can use out of my machine is around 15% less than what would be the theoretical maximum, and no surprise to me. So it does not make sense to use the machine above that 80-85%. I keep the machine running below that percentage, and I hope this will extend the tube lifetime too. 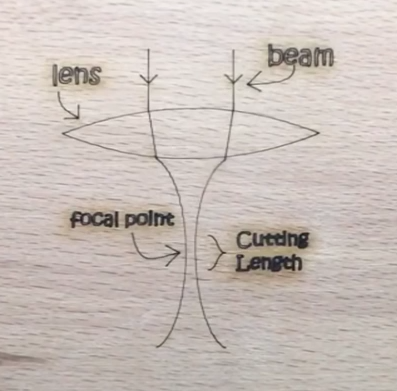 This entry was posted in Acrylic, Laser, Laser Cutter, Thoughts, Tips & Tricks, Wood and tagged Acrylic, CO2, Cutter, Focal Point, Laser, Lens, Plywood, Power, technology, Thoughts, Tips&Tricks by Erich Styger. Bookmark the permalink. Nice article Erich. The same is true about WiFi too, isn’t it? If you want to actually check it, you need a probe like this: http://www.2laser.com/laser_power_meter_probe_and_laser_monitor You might be able to make one with a block of aluminum treated with the right material and a thermocouple. The wiggles you are getting are either due to belt tension or to stepper harmonics. Most machines will gear the output between the stepper and drive belts with a pulley assembly to move this out of the typical cutting speed range. The other part, the belts vibrating, this also can be fixed with having a geared down assembly to reduce the belt tension needed to keep it tight without skipping. I’m not sure about your specific machine. Thank you for that link for a laser power meter probe! And good hint about the belt tension or stepper harmonics, so I have to check this out. I recently acquired a machine like yours and am currently getting to know it. 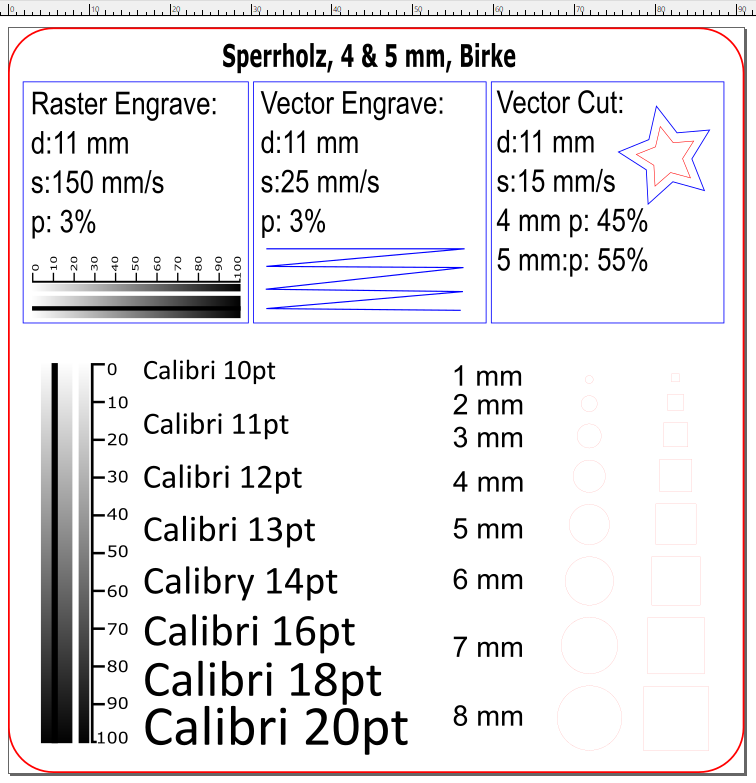 Therefore, It would be absolutely awesome if you could upload/share all ‘cheat’ sheets you made with us (inkscape-files would be best)!! That way I (and people like me) would have a starting point for our experimentation and optimization.